So far this year, there have been numerous accidents in Jackson near I-94 and US-127. However, one of the most serious incidents occurred in June 2015, when there was a catastrophic nine-vehicle pileup at the interchange, including three jackknifed semi-trucks. The crash sent 11 people to the hospital. And just a few days after that accident, several crashes closed eastbound I-94 between US-127 and Cooper Street. Notably, I-94 is listed on the National Highway System — a network of roads designated as crucial to the U.S. economy and mobility. As a result, I-94 frequently is the site of car accidents and semi-truck accidents. 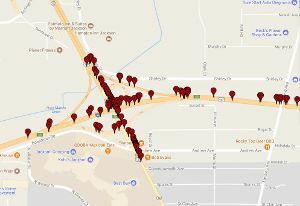 The red pins mark the 2016 car and semi-truck accidents at I-94 US-127 in Jackson. 33 accidents happened near entrance and exit ramps. most crashes occurred in January. 17 collisions were caused by drivers age 65-74.
the most dangerous time to drive in the area is 5-7 p.m. (28 crashes total). most crashes occurred in June. 22 crashes were caused by drivers age 60-64. 40 collisions occurred near entrance and exit ramps. the most dangerous time to drive in the area is 5-7 p.m. (44 crashes total). Why The Increase In Accidents At I-94 And US-127? I-94 is a major east-west shipping route between Detroit and Chicago. As such, it sees a fair share of semi-truck accidents, including where the interstate meets US-127 in Jackson, around the Cooper Street exit. Meanwhile, as the above 2015 and 2016 statistics show, passenger vehicles are also involved in many accidents on I-94 and US-127. a steady and heavy amount of traffic along I-94. a steady amount of traffic to and from a retail shopping center near the I-94 US-127 interchange. short exit and entrance ramps. congested exit and entrance ramps. distracted driving — 28 crashes in 2015 and 27 crashes in 2016 were caused by drivers age 16-20 and, unfortunately, younger drivers are known for using their cell phones behind the wheel (talking, emailing, texting, social media) — notably, I-94 is a popular route for students traveling to and from Western Michigan University in Kalamazoo. speeding (for both passenger vehicles and semi-trucks). be alert and aware of their surroundings. keep their attention on the roadway (i.e., put down the cell phone). If you’ve been injured in an accident at I-94 and US-127, or anywhere in Michigan, the Sinas Dramis Law Firm is here to help protect your right to no-fault PIP benefits and any other compensation to which you may be entitled. Contact our Lansing car accident lawyers or Grand Rapids auto accident attorneys today for a free consultation.